Columbus is the capital of Ohio. 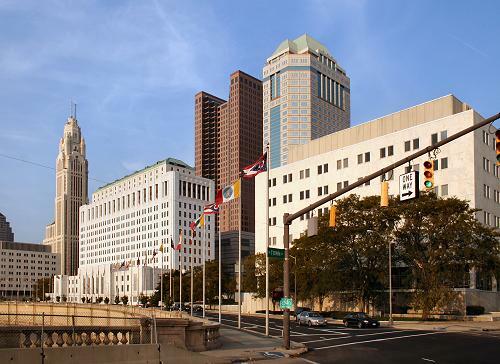 As of the 2000 census, its population was 711,470 making it the largest city in Ohio, and the 15th largest in the United States. Columbus was founded on February 14 1812, and is named after Christopher Columbus. Leading education institutions in Columbus include Franklin University and Ohio State University. Franklin University is a private university in downtown Columbus. Ohio State University is a coeducational public research university. Ohio State is in fact the largest in the United States, with over 50,000 students based in the Columbus campus alone. Sports teams in Columbus include the International League baseball team, the Columbus Clippers, the NHL ice hockey team, the Columbus Blue Jackets, and the soccer team, the Columbus Crew. Some of the leading companies with their headquarters in Columbus include Commerce National Bank, Huntington Bancshares Inc. and Nationwide Mutual Insurance Company. Nicknames of Columbus include "Buckeye City", "C-Bus", "Cowtown", "Indie Arts Capital of the World", "Somaliwood" (in reference to the city's Somali film industry), "Test Market, USA", "The Arch City", "The Biggest Small Town In America", and "The Discovery City".